Of the three battles shown on the map, the first, the Battle of Galambóc, happened in 1428, during the reign of Sigismund (1387-1437). The second, the fall of Szendrő happened on 18th of August 1439, when the defenders could no longer oppose the well-equipped armies led by Murad II. Although the Hungarian army was stationed nearby, they didn’t attempt to free the besieged fortress. The third battle was the Battle of Mohács (29th August 1526), which later proved fatal, and among several events, it led to Ferdinand, the Austrian archduke, claiming the Hungarian crown. Following this, Ferdinand I Czech and Hungarian king could expect help from the Holy Roman Empire as the Austrian archduke, because the Empire, although listened to the Iagello kings’ (Vladislaus II and Louis II) requests for assistance, didn’t send help. Louis II’s emissary, Ladislaus of Macedonia, argued for collaboration in his dramatic speech about the vulnerability of Hungary and Austria, but it was in vain. On the Tabula Hungariae, the present, the situation after the Battle of Mohács, also gets a significant role. For the first time in the world, a boundary marker appeared that separated the Christian and the Ottoman areas. For a more pronounced impact, the editor of the map also suggested the use of colours, in order to make the expansion of the Pagans even more obvious. However, the map could only be printed in black and white. 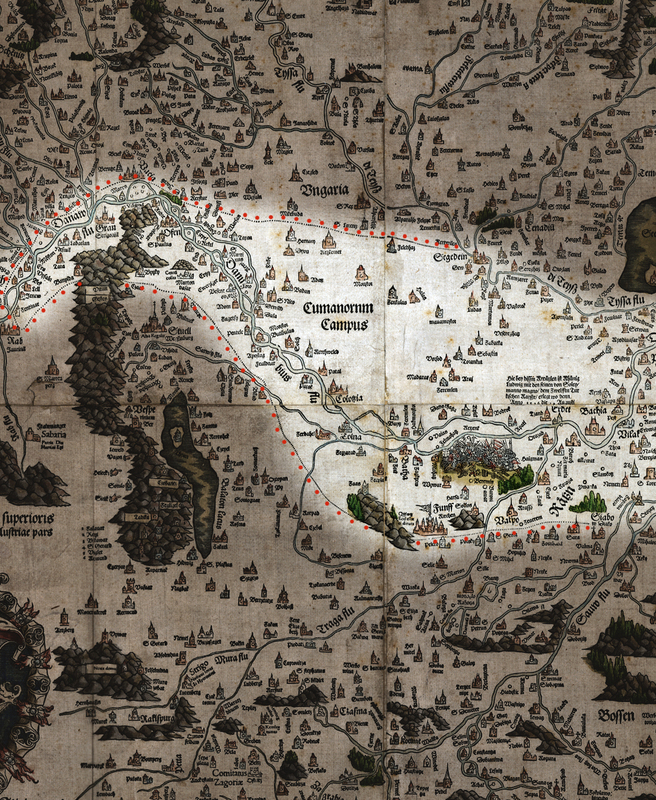 The map fit its political role perfectly in bringing the danger close to everyone – as told in the poem only appearing on the 1528 edition, under the caption “Pars Poloniae”.